What’s the second most important metric of your email campaign after the open rate? It’s the click-through rate (CTR). Just imagine how disappointed you’d be after getting a smashing open rate, only to lose readers with an email that failed to prompt clicks. A great email draws readers in and gets them to click. 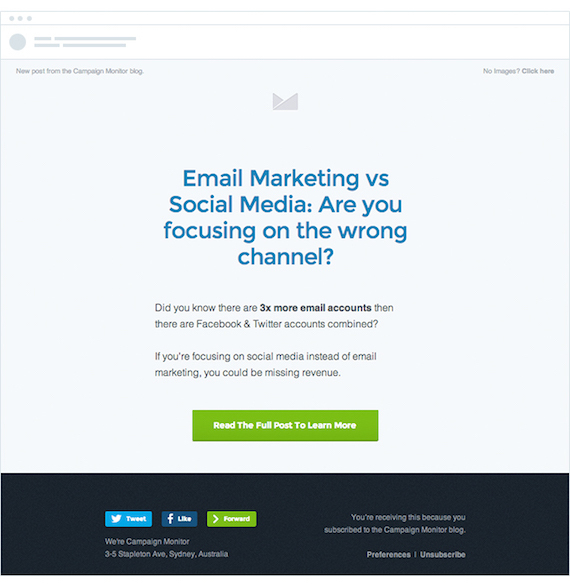 So, here are 14 tweaks of an email designed to convert. Even inconsistency with your brand will boost clicks on one link, but that’s the one for unsubscribing. Since you aren’t pursuing that, make your emails look consistent with your website. Adding your logo as the first element of your email is a handy way to do it. 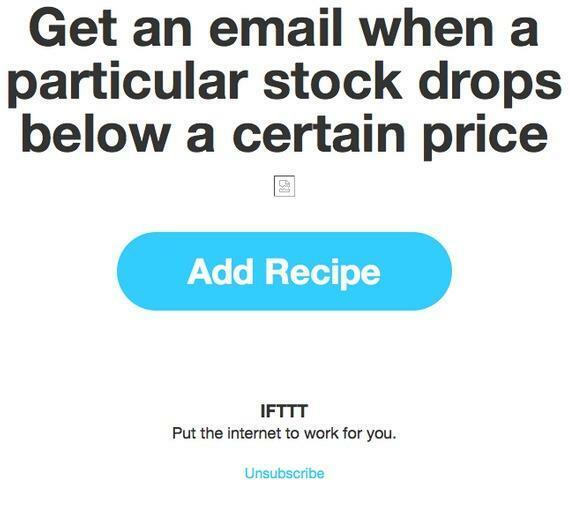 A good example of a branded email is that of IFTTT, a cool service that lets you automate things like putting your phone on the general or silent mode — and a ton more. As you can see, the email is too IFTTT to not recognize. You should strive for consistency between your website and emails. How you present your information determines how your readers receive it. If you plan your email’s layout well, you can get your readers to move naturally towards your Call-to-Action (CTA). 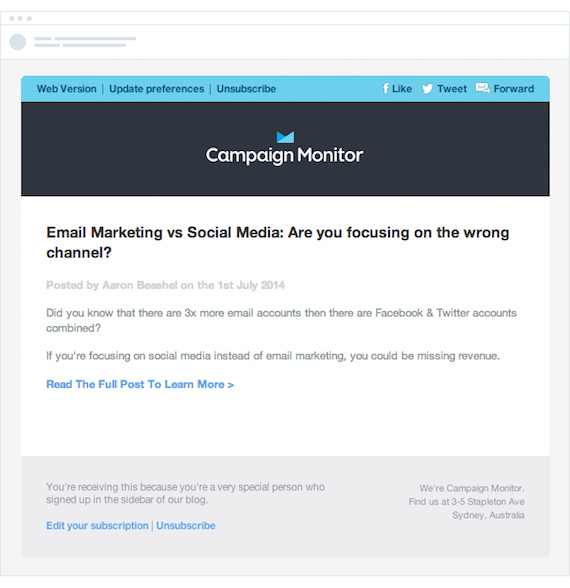 Campaign Monitor got a 127% increase in email click-throughs by redesigning their blog email. MailChimp’s email design reference guide recommends using a single column layout if you want your readers to perform a specific action. Multi-column layouts often suit emails that have a lot of content to share. These could be email newsletters or product emails that discuss lots of features. Campaign Monitor analyzed over 1.8 billion opens from nearly 22 billion email recipients in 2013. About 28% opens happened over the desktop email clients. Considering the number of email clients and their versions, it’s challenging to create pixel-perfect experiences on all of them. However, you should care about their default preview widths (about 600 px). If you want the important parts of your emails to show up in these previews, keep their width under 600 px. Check out this infographic that outlines how to create a responsive email design. Vero analyzed over 5000 campaigns and found that campaigns with images had a 42% higher CTR than campaigns without images. Another survey by HubSpot shows that 65% of respondents prefer emails that contain mostly images vs. 35% who prefer mostly text. While your emails must make complete sense even without images (also called designing for the images off experience), it’s important that whichever images you use add meaning to your story. Also, since images are turned off by default in most email clients, you should add relevant alt texts to them. This text shows up even if your image is not displayed. Most email marketing services let you easily fill this field for your images. You can also try adding links to images as they’re easier to click over the mobile as compared to button or text based CTAs. Whether you optimize your email content for the F-pattern or not, that’s how people will read (scan) it. Try to front-load your emails to offer the most important content immediately. Design them for scanners who begin at the top quickly making their way to the end. Princeton psychologist James J. Gibson defined affordance as a possible action between an object and an individual. Or you could say that affordance is the most obvious thing to do with an object – in the case of a button, it’s clicking. Clicking on a CTA button comes as naturally to us as twisting the knob of a door, or pulling the handle of another. Always try to use buttons for adding your primary CTAs as they prompt readers to click. You should use text links whenever you want to add secondary CTAs. And when you use them, make sure they are noticeably long. MailChimp’s analysis shows that linking a phrase with about 7-10 words is great for boosting CTRs. Most email clients don’t display images by default. So if you are using a button image as your CTA, it’s possible that readers won’t see it at all. Another reason for avoiding image buttons is to eliminate any lag that an image server may cause. The only downside is a slight compromise on aesthetics, but you can live with that. Wunderlist uses some stunning HTML buttons. Even with the images blocked, the CTA button stands out. When it comes to giving choices to customers, less is always more. More choices often cause fewer conversions. This applies to email CTAs too. There are lots of resources to back this. Marketing Sherpa tells how Whirlpool got a 42% CTR increase by bringing down the number of CTAs in its emails from 4 to 1. HelpScout increased click-through rate by 17% by retaining just a single CTA in its email campaigns. Placing CTAs to the left of text and image sections looks and feels inconvenient as you require the reader to go back (to the left) to it to do the action. It’s the Gutenberg pattern that’s at work here. Designers often follow this pattern to make sure that they place the important elements in the important focal areas. Ideally you’d like your readers to consume all the information before they see your offer. Placing your offer (or CTA) on the right does the trick as we read from left to right (that’s also probably why the scroll is on the right). “As directional cues, arrows are about as subtle as a punch in the face. That’s why they work.” – Oli Gardner. If arrows feel like going overboard, you could try several other ways of adding visual directional cues. They can be as subtle as white space. You can also use eye direction cues as human beings follow the line of sight of other people. Try using images that show a person looking in a particular direction. Your CTA should appear at the end of the trail. If there’s some section of your email that’s as important as your email’s opening line, then it’s the P.S section. Copywriters have known (and used) this forever. This TechCrunch story about how Hotmail hacked its way to over 3000 accounts/day had me wondering if the Hotmail guys knew that the little P.S trick they used was backed by a proven psychological trait called the Serial Position Effect. At the crux, the Serial Position Effect states that the item that’s placed last in a series draws as much attention as the item placed at the beginning of the series. In your email, the P.S section is placed at the end. So it draws attention. Besides, you never know how many of your email subscribers go right to the bottom of your email reading nothing at the top or in the middle. So a P.S section will score big time in getting these skimmers to click too. 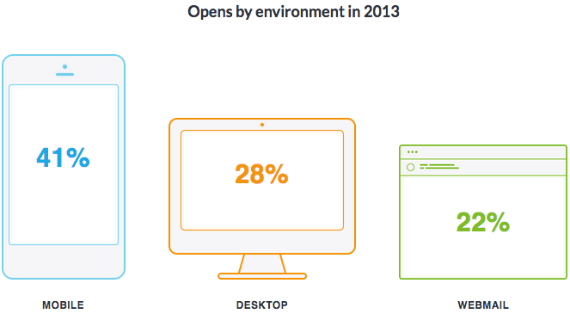 Litmus shares some intriguing email open environment trends. 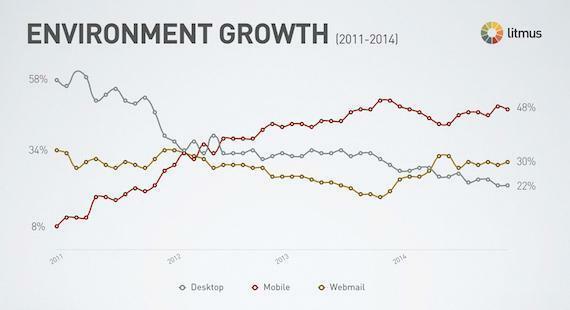 Mobile email open rate saw a 500% hike in 4 years between 2011 and 2014. A study by Campaign Monitor found that between 2010 and 2015, mobile email open rates grew by 30%. By making your emails responsive, you won’t just extend a smooth mobile experience to your readers, you also hold their attention for longer (thereby getting more clicks). GetResponse has put together an interesting infographic about email social media buttons contributing to a higher email CTR. The spike in CTR comprises the clicks made on the social media buttons/links and the clicks made by people whom the email reached via social sharing. Just look at the following screenshot. Passing the squint test is easy as getting that “big yellow CTA button” obvious even after significantly blurring the screen resolution. 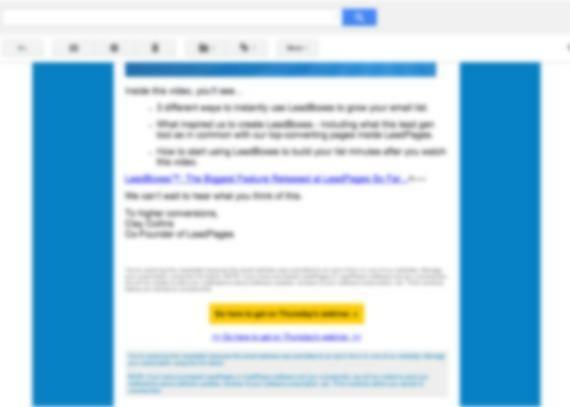 Imagine if this email carried a text-based CTA… it would have had no chance at making an “obvious” impact. So if you’re using buttons for adding CTAs, the next step is to make sure they are effective. 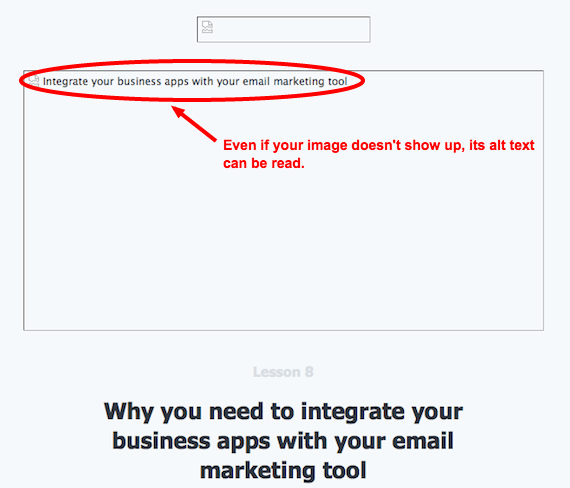 If your email doesn’t pass the squint test, then your CTA button isn’t as obvious as it should be. And so it won’t be as effective as you’d like it to be. Grab this cool squint test Chrome extension and don’t send another email before it passes this test. Simple email design tweaks can result in a higher CTR. Has any design tweak ever worked great for you? Do share in the comments! About the Author: Disha is an online marketing writer, specializing in email and content marketing. She has sent tons of emails in her last job and just can’t stop analyzing what worked, what didn’t, and why. You can follow her on Twitter.